A Lake District farmer has won an appeal to quash his conviction for recklessly disturbing an osprey nest. Paul Barnes, 58, was originally found guilty of scaring the protected birds when he drove his tractor with children in a trailer at Bassenthwaite in 2017. 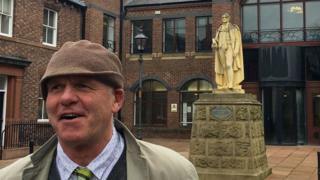 However, a judge at Carlisle Crown Court has ruled the matter was an "agricultural disturbance" and not a crime. Following the appeal hearing Mr Barnes said he had been through "turmoil". He was convicted in August 2018 of two counts of intentionally or recklessly disturbing a male and female osprey on 13 June in 2017. The charges were brought under the Country and Wildlife Act 1981 and the court at the time also ordered him to pay a £300 fine plus £2,000 in legal costs. The court heard originally that cameras monitoring the site had shown Mr Barnes and his group right below the nest. The birds then flew off returning 20 minutes later. However, Judge James Adkins ruled earlier that: "Observations had been undertaken of nest disturbances not wholly dissimilar to the current circumstances - in some cases arguably worse." "They are characterised as agricultural disturbances and not criminal offences." Mr Barnes, a farmer for 35 years, is also a qualified primary school teacher and has won national awards for conservation and children's education. Following the appeal hearing he said he was "emerging from 18 months of turmoil". He continued: "I'm pleased with the outcome and relieved." Ospreys are a schedule one species, which means it is an offence to intentionally or recklessly cause disturbance at, on or near an active nest. The birds returned to the Lake District in 2001 following an absence of 150 years. Since then they have become a tourist attraction and can be observed from viewpoints or via a webcam.